When we think of monuments to early American heroes and events, we might recall efforts such as the Bunker Hill Monument in Boston, Massachusetts; statues of George Washington by Jean-Antoine Houdon and Horatio Greenough; or the sculptural decorations of the United States Capitol. But long before any of these works existed, there was the Monument to General Richard Montgomery, sculpted in 1777 by French artist Jean-Jacques Caffiéri and installed on the porch of St. Paul’s Chapel in Manhattan in the mid-1780s. 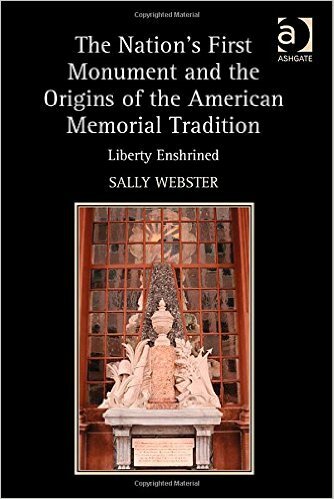 In The Nation’s First Monument and the Origins of the American Memorial Tradition: Liberty Enshrined, Sally Webster explores the history of this all-but-forgotten memorial and restores its position in the canon of early American national art. The monument is a wall sculpture composed of symbols of military heroism: palm fronds, flags, a helmet and armor, and a club. It was erected in honor of General Richard Montgomery, a brigadier general in the Continental Army who led an invasion into Canada in the first months of the Revolutionary War and perished on December 31, 1775 during an attack on the city of Quebec. As one of the first American officers to die in battle, Montgomery’s death became a national call to arms, and the Continental Congress voted to erect a monument in his honor. Webster examines the history of this monument in order to draw parallels between American traditions and European models, to frame early American nationalism in an Atlantic World context, and to argue for the monument’s place in American sculptural studies. The first two chapters of the book explore precedents for the Montgomery Monument. In Chapter One, Webster investigates the origins of a memorial tradition in America through several artistic homages to the heroes of the French and Indian War. These artworks, including a loosely-connected group of portrait paintings by different artists known as the “Louisburg series” and a range of tributes to the death of General James Wolfe, indicate an early interest in commemorative activities to honor important heroes. Webster argues that these tributes, most of which were executed in England or intended for private American homes, laid the foundation for future outdoor monuments that drew from European traditions. Those early examples of public sculpture are the subject of Chapter Two, which examines tributes to William Pitt and George III erected in New York in the wake of the Stamp Act Crisis. In the 1760s, New Yorkers commissioned an equestrian statue of George III and a standing figure of William Pitt, both executed by British sculptor Joseph Wilton, to thank these statesmen for their role in repealing the hated Stamp Act. Both victims of iconoclasm during the ensuing Revolutionary War, these statues nonetheless served as important predecessors to tributes to American heroes. The book’s three remaining chapters deal directly with the circumstances surrounding the Montgomery Monument. Chapter Three offers a biography of General Richard Montgomery from his time in the British ranks during the French and Indian War to his heroic death during the siege of Quebec. In the fourth chapter, Webster explains the role that Benjamin Franklin played in securing Jean-Jacques Caffiéri to sculpt the monument to Montgomery while on a diplomatic trip to France in 1777. And finally, Chapter Five explores the installation of the Montgomery Monument in St. Paul’s Chapel in the late 1780s alongside the brief period when New York City was the capital of the United States. This installation was carried out by Pierre Charles L’Enfant, who placed the sculpture outdoors in front of the chapel’s massive Palladian window and designed an elaborate altar for the church’s interior to mask the unfinished back of the Montgomery Monument. In this final chapter, Webster investigates the parallels between the Montgomery Monument, the Great Seal of the United States, the founding of the Society of the Cincinnati, and the inauguration of George Washington as the first President of the United States. This book will be of great interest to scholars of early American visual culture and cultural nationalism. Webster has assembled an impressive array of primary sources in order to demonstrate the Montgomery Monument’s significance during the war years and in the era of the early Republic. Her chapters explore the early American monument tradition, persuasively demonstrating that colonial Americans thirsted for memorials to heroic deeds long before independent nationhood became a reality. In so doing, Webster taps into a recent trend in American sculptural studies to expand the boundaries of the discipline to focus more explicitly on eighteenth-century practice. Scholars such as Wendy Bellion and Katie Wood Kirchhoff have argued for a reevaluation of artistic timelines that begin with the American expatriate sculptors of the early nineteenth century. These scholars have suggested that Joseph Wilton’s statues of William Pitt and George III, wax figures by Patience Wright, and pediment sculptures designed by Benjamin West may offer fertile new ground in investigating American sculptural tradition. In reintroducing a long-overlooked monument to the canon of American sculpture, Webster adds a valuable contribution to this conversation. While engaging this conversation, Webster demonstrates that the Montgomery Monument bears a strong relationship to the era’s visual culture of nationality and memory. Her chapters on French and Indian War heroes and reactions to the Stamp Act Crisis set a clear precedent for Jean-Jacques Caffiéri’s monument to an American Revolutionary hero. She draws clear parallels between the story of General Montgomery and that of General James Wolfe, who died in battle on September 13, 1759 on the plains before Quebec. Wolfe was later memorialized in a 1770 painting by Benjamin West that introduced contemporary scenes and garments to the tradition of history painting. That both heroes died while battling for control of Quebec was not lost on the American populace, and Montgomery was eulogized as a second Wolfe. The statues of William Pitt and George III, too, indicate a city and nation looking for the means to erect memorials to important heroes. These statues by British sculptor Joseph Wilton demonstrated that Americans were willing to look to Europe not only for artistic inspiration but also for artists who could render competent statues in metal or stone that could not be produced by means available in the colonies. These examples add depth to a study that interrogates how the first monument in America came to be. One question that surfaces in reading Webster’s narrative is whether her interrogation of the story of General Richard Montgomery could be applied to other early heroes of the Revolutionary War or of other American wars. Webster establishes that Montgomery became a war hero and his name a call to arms after his death in the assault on Quebec. But over the course of the war, he was eclipsed in fame by other military leaders and significant events, and his foray into Canada is little remembered in most histories of the Revolution. This phenomenon is not uncommon in wars of long duration, as early martyrs are supplanted by the heroes who see the conflict to its conclusion. Webster has done much to call attention to Montgomery’s story: this research could be placed in dialogue with studies of Major General Joseph Warren in the Revolutionary War or Elmer Ellsworth of the American Civil War. There also may be a larger story related to hierarchies of artistic genres at play in regard to the Montgomery Monument. In her introduction, Webster recalls learning of the Montgomery Monument’s existence through a National Park Service timeline listing it as the first American memorial, and immediately rushing to visit it in Lower Manhattan (1-2). She expresses surprise that this first example of national monumental sculpture is largely forgotten, and later laments that its sculptor, Jean-Jacques Caffiéri, was passed over for a commission to sculpt a statue of George Washington in favor of Jean-Antoine Houdon (154). But the Montgomery Monument and its sculptor may have slipped from memory due to formal considerations: the memorial is a wall sculpture composed of military trophies adorning a hero’s tomb. Much has been said about eighteenth-century ranking of artistic genres in painting, from the vaunted history painting to the less-respected genres of portraiture, landscape, genre, and still life. But sculpture also has its hierarchies, with equestrian statues and full-length human figures more esteemed than non- human allegory and architectural decoration. And in choosing a sculptor to immortalize George Washington, early Americans may have preferred the classically-trained Houdon to Caffiéri, who learned to sculpt as a member of a family of decorators and bronze founders. For better or for worse, questions of societal class and artistic hierarchy shaped early conversations on a national art identity, as Americans looked to Europe for guidance in shaping their visual world.In emphasizing the relationship between American and European visual culture in an Atlantic World context, Webster illustrates the forces that may have pushed the Montgomery Monument out of American memory. Webster begins and ends The Nation’s First Monument by evoking the Montgomery Monument’s proximity to the site of the September 11 attacks: St. Paul’s Chapel is directly across the street from the World Trade Center site. In the months after 9/11, the chapel became a haven for first responders and took on new meaning as a shrine to those who had fallen on that day and those who had gone to their aid. In the wake of the tragedy, the monument was cleaned and restored, and now sits as a symbol of survival and memory. In calling attention to the Montgomery Monument and its contemporary resonances, Webster ties the story of a nearly-forgotten hero to recent cataclysmic events. About the Author(s): Sarah Beetham is a Lecturer in the Department of Art History at the University of Delaware and at the Pennsylvania Academy of the Fine Arts.